Earlier in the tournament, Varkonyi had three-bet all in with Queen-Ten suited only to get called by Phil Hellmuth’s Ace-King suited. A flop of Ace-Queen-Ten put Varkonyi ahead for good, crippling the Poker Brat. When Hellmuth was commentating on the nine-player final table, he promised that he would shave his head if Varkonyi, who had a medium-size stack, won the title. Hellmuth kept his word, and Varkonyi himself shaved off the first locks, with Becky Binion-Behnen finishing the job. 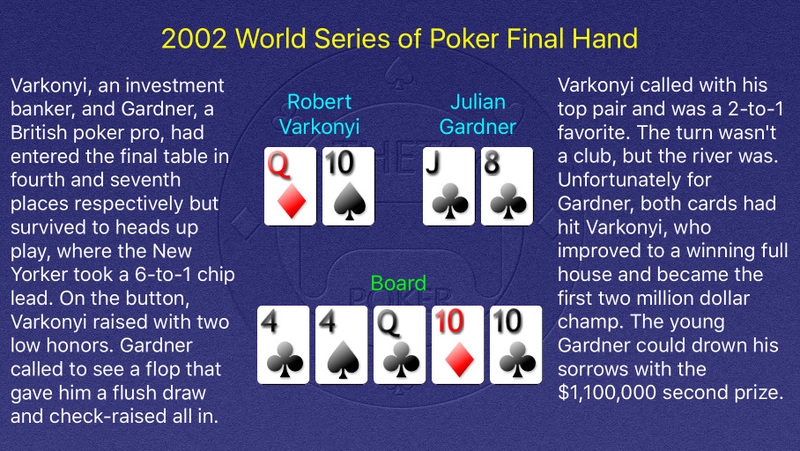 Varkonyi has two other Main Event cashes and two other WSOP cashes, none for more than five figures. Gardner’s second place finish made him the youngest poker player to win over a million dollars in a single tournament. He would have supplanted Phil Hellmuth as the youngest Main Event champ if he had won.